Hopefully, you’ll never confuse P100 over P1000 bill again. NO MORE CONFUSION? In response to the public's suggestions, the Bangko Sentral ng Pilipinas will be releasing stronger, violet or mauve-colored P100 bills, hopefully, to lessen confusion of such over P1000 bills. MANILA, Philippines – The Philippines’ central bank (BSP) is issuing P100-banknotes with stronger mauve or violet color starting Monday, February 1. “This is in response to suggestions from the public to make it easier to distinguish from the [P1000] banknote,” BSP said in a press release on January 29. In May 2015, Philippine Senator Aquilino “Koko” Pimentel III asked the country’s central bank to explain why the P100 and P1,000 banknotes almost look the same. He did so because his office received numerous complaints over the similarity of the bills, which are included in the New Generation Currency (NGC) banknotes issued by the BSP in December 2010, and which became the currency in circulation starting this 2016. 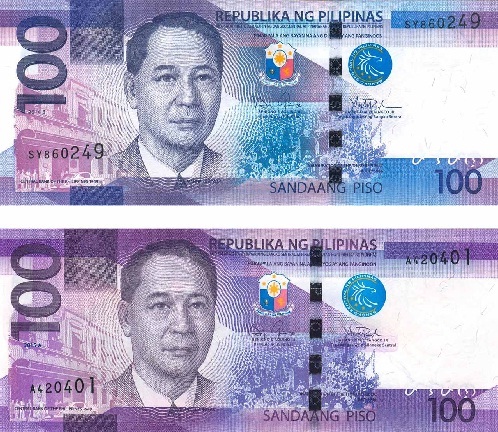 So in October 2015, BSP announced that it would be releasing an improved P100-bill by January this year – same design but a darker shade of mauve or bluish gray, BSP Governor Amando Tetangco Jr described then. “There are instances wherein consumers pay the P1,000 bill instead of the P100 bill especially at night. With the new P100 bill, they could easily distinguish it from the P1,000 bill,” Tetangco earlier said. The security features in the current P100 bills remain the same. The improved P100 banknotes will have stronger mauve or violet color on the obverse and reverse sides. BSP said the current P100 banknotes can still be used for daily transactions for payment of goods and services and will commingle with the new P100-bills with stronger mauve or violet color until supplies of the first version last. “Henceforth, the BSP will be printing the [P100-bills] with stronger mauve or violet color,” it said. Also, BSP again reminded the public that only the old banknote series (New Design Series, NDS), launched in 1985, will no longer be acceptable in daily transactions for payment of goods and services and can only be exchanged for NGC banknotes with authorized agent banks and the BSP until December 31, 2016.